Adds rings that are worn on the left hand. You can wear two rings at once, one on each hand. These rings can be crafted, enchanted, bought from merchants, and found randomly as treasure. Add CCO recipe hiding conditions. from merchants, and found randomly as treasure. 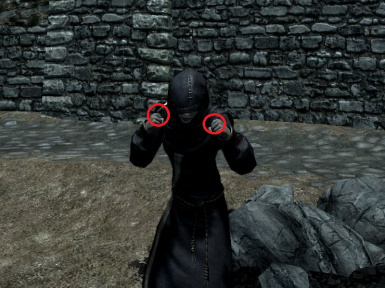 left-handed rings in their inventory. in merchant inventories and treasure chests. window will ask whether you also want the Dawnguard option installed. silver ring. This will let you know that the mod is working. Rings" to deactivate it, then click "Delete". read the following Guide by Shadowjin. Dienes, or "EK_RingLimiter" by ekroemer. else (vampire mods, werewolf mods) that also modified these scripts. Be happy I got the Ring of Hircine working. me know if you find conflicts. This file is available on the Skyrim Nexus and the Steam Workshop. Bethesda for the Skyrim Creation Kit. Also, for the bugs. Fallout Mod Manager (FOMM) for TESsnip and BSA Browser. 1.0, 2012/08/04 - Initial release. 1.1, 2012/08/19 - Fix the crashes. 1.2, 2012/11/08 - Recompile for Skyrim 1.8. 1.3, 2013/03/27 - Add Bone Hawk Ring and Bond of Matrimony. 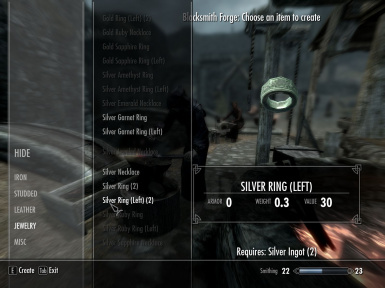 1.4, 2014/01/05 - Add Ring of Hircine, bugfixes. 1.5, 2015/04/06 - Add CCO recipe hiding conditions. finger of the left hand. Save the mesh and exit. read and follow Appendix A above as well. appropriate mesh from this mod.